The app contains some of the most well-known Chinese children songs and tongue twisters. If you’d like your kids to learn Chinese in a fun way, children’s songs are beginner’s best choice. Chinese children often sing these songs and do hand gestures at the same time, and it is sometimes interactive. Basically it is like playing a game. 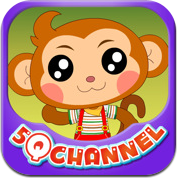 To be more specific, this app will help children to learn the numbers 1~10 through singing. Here is a sample video clip: click here.